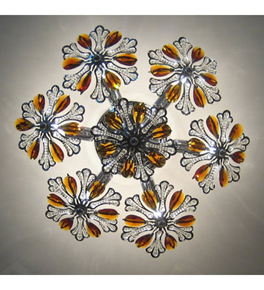 Made to order flush fitting Murano style glass ceiling lights with a variety of colours and finishes. All the chandeliers and light fittings in this section are fitted directly to the ceiling. They are not suspended from the ceiling on a chain or post. Like suspended chandeliers, surface mounted chandeliers come in a huge range of sizes and almost infinite design or style variations.